One thing I found interesting in the top chart is the steep drop of GI-generation legislators during the years at the end of the cold war. I can’t help but wonder at the relatedness. 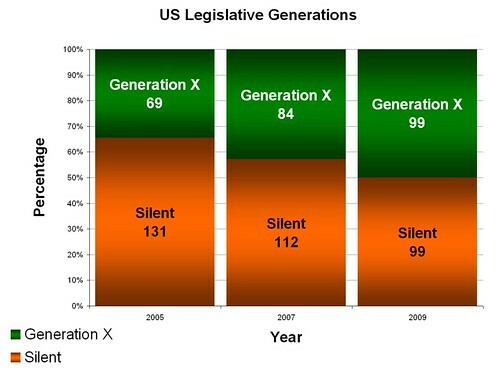 Also, in a way, the generational shifts in the legislature are interesting because, while the Boomers remain a huge distracting bulge in the demographics, I think a lot of the feeling of shift in the government comes from Gen Xers gradually taking over (winning out?) over their “parents”–the Silents. Boomers still seem to make most of the decisions, but I think the X/Silent shift is accounting for much of the present changes in feel and tone. @Vi, yeah, that legislature chart is interesting. I am still puzzling about the implications of it. And I have to agree that X’ers are going to have a huge impact that is not being recognized. If generational cycle holds true, the X’ers contribution will likely never be recognized. One thing to keep in mind, is that as more Silents disappear from politics their positions won't entirely be filled by GenXers. GenY will also be moving into politics. 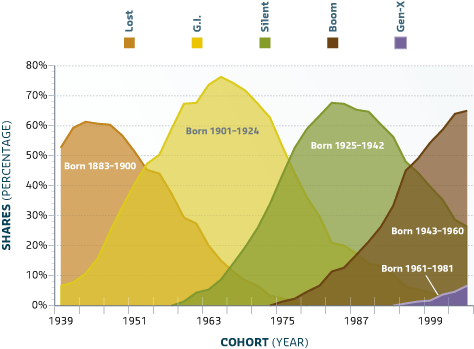 I'm not sure how much GenY will compete with GenX. I suspect that GenX as a smaller demographic might look for agreement with GenY in fighting against the Boomer political behemoth. 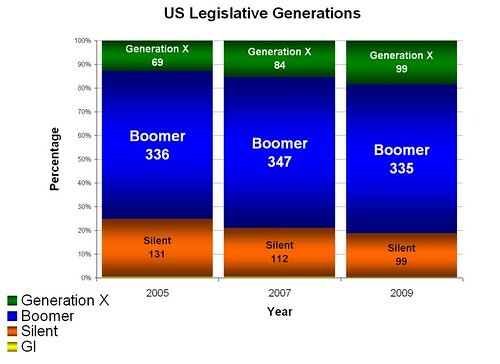 The big battle will be between Boomer and GenY, and GenX will be the deciding vote. Also, GenXers have the opportunity to act as leaders and advisors for GenY.